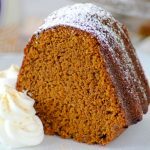 This Chai Spiced Pumpkin Cake is so moist and delicious, it will be the center of your fall dessert table. BUT everyone will want to eat it all year long! This is a sponsored conversation written by me on behalf of Oregon Chai®. The opinions and text are all mine. Throughout the year, it’s important that I incorporate some “me time” into my daily routine. *This post contains an affiliate link(s). However, I find I require “me time” even more this time of year. During the holiday season, there are SO many activities, places to go, people to see and things to bake – not to mention all the work that needs to be done. Sometimes, I can’t keep up with all of it and want to call it a day come mid-morning! 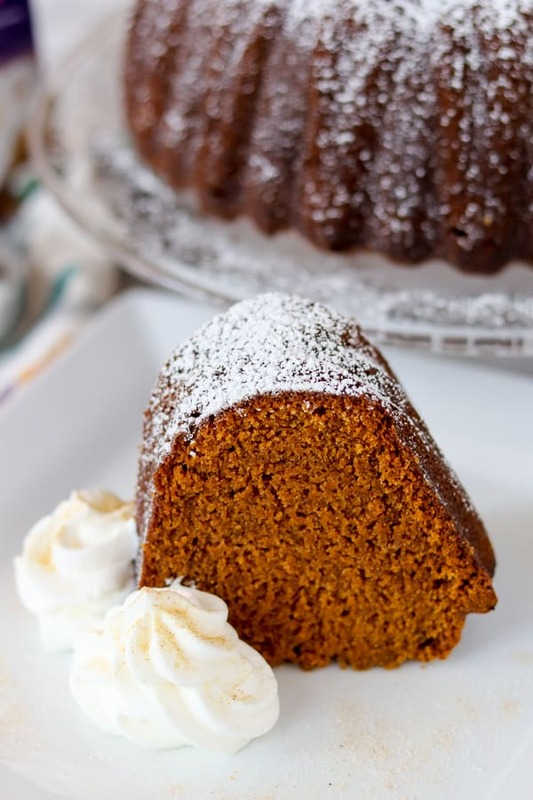 SAVE THIS CHAI SPICED PUMPKIN CAKE TO YOUR FAVORITE PINTEREST BOARD! Also, as a mother of three, I’ve always found it difficult to schedule time in my day just for me. Whether it’s to exercise, have lunch with a friend, enjoy a walk in the park or read a book, I just don’t do it. Then, when I do, I often feel guilty because I know there are so many people needing my attention. I can’t be alone here, right? Now that my children have left “the nest,” I have more time on my hands (except for this puppy we recently acquired – but more on cute little Logan later). More time on my hands also means shopping at my local Target! I love going there because I can find everything I need in just one place. Yet, I can still hear that little voice in the back of my head saying, “You have no time for you; you need to get this done!” Old habits die hard I guess. As I’ve gotten older, I’ve come to realize that “me time” IS ridiculously important. Because face it, if I’m not taking care of myself and doing things to refresh, energize and bring joy to my life, then I have nothing left for anyone else. As women and mothers it’s so easy to forget, and we leave ourselves sitting on the back burner. That’s why this holiday season I’m making it a point to schedule some of that very important downtime into each and every day. 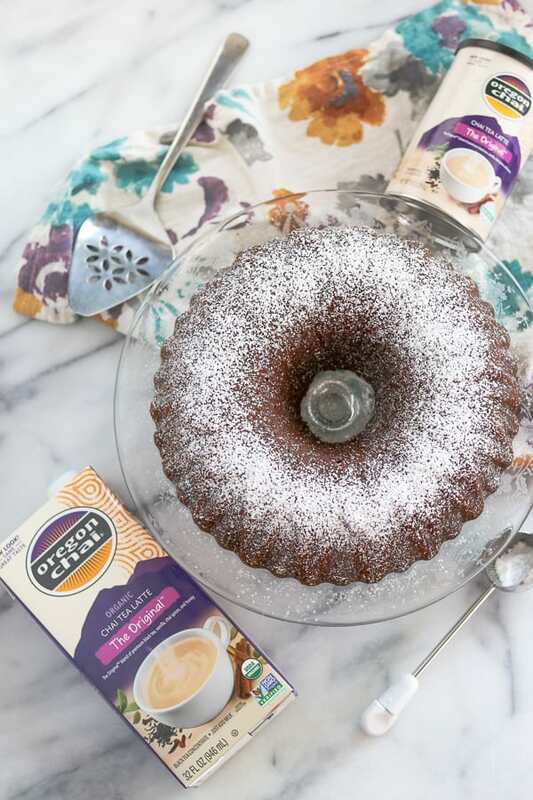 Whether it’s reading a good book or catching up on my latest Netflix show, you can bet I’ll be eating a slice of this Chai Spiced Pumpkin Cake while doing it! My love of chai started at the turn of the century (sounds weird to say, doesn’t it?) when we were still living in Rhode Island. “Me time” back then also included chai, just as it does now. Although now, I love that I’ve discovered Oregon Chai®! 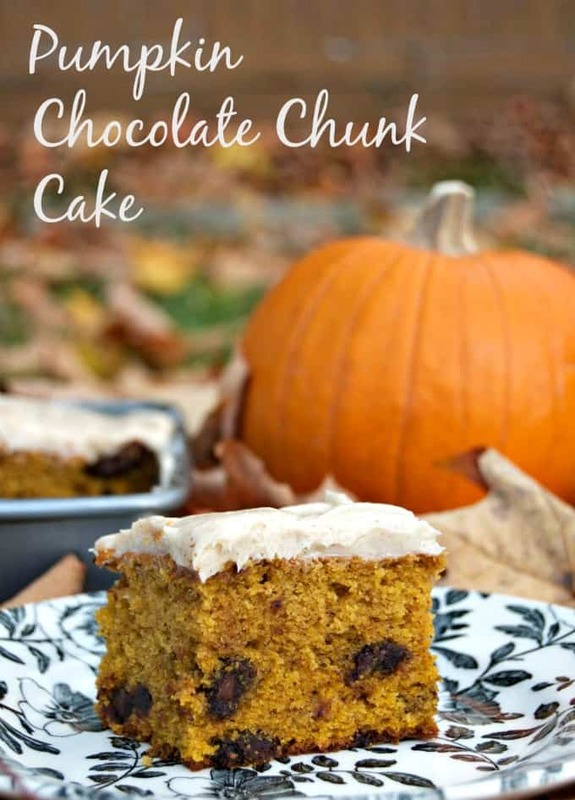 I’m using it IN this Chai Spiced Pumpkin Cake recipe as well as enjoying a cup every day. 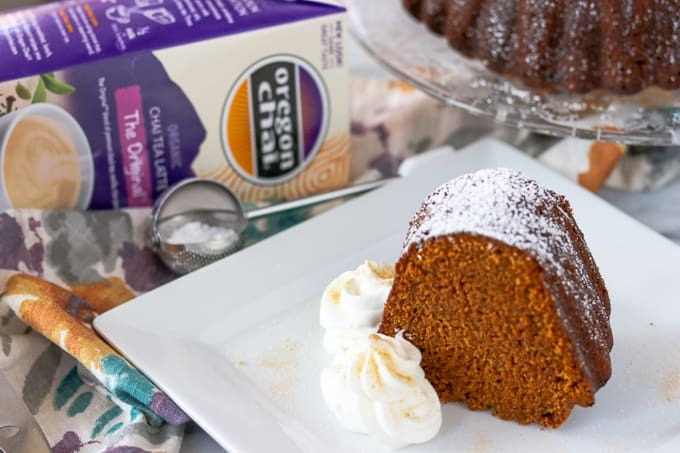 You can make “me time” even better when you head to Target to pick up some and Oregon Chai Powdered Mix to make this easy pumpkin cake recipe. Find an offer for Oregon Chai with Cartwheel in the Target app! 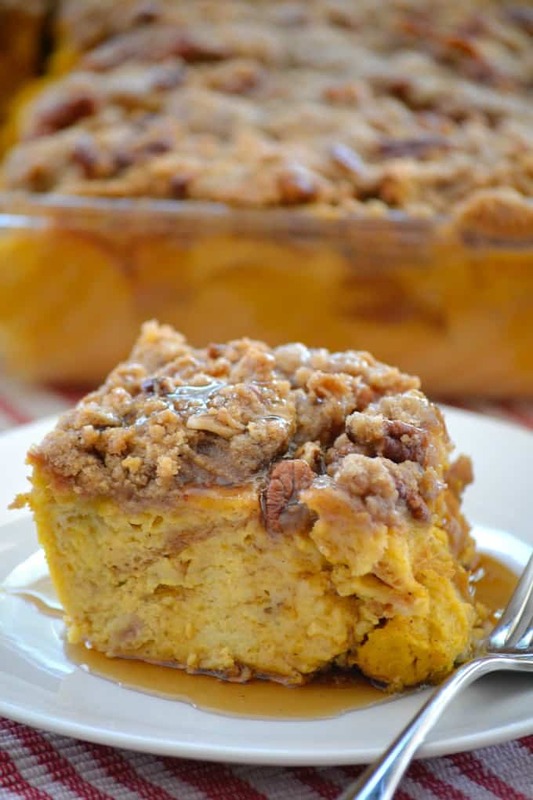 I admit I’ve never been a huge pumpkin fan – pumpkin pie or pumpkin cake. I DO NOT like pumpkin pie, so don’t even offer it to me. I’ll take a slice of my aunt’s Apple Cream Pie over that ANY day! BUT I have a confession. 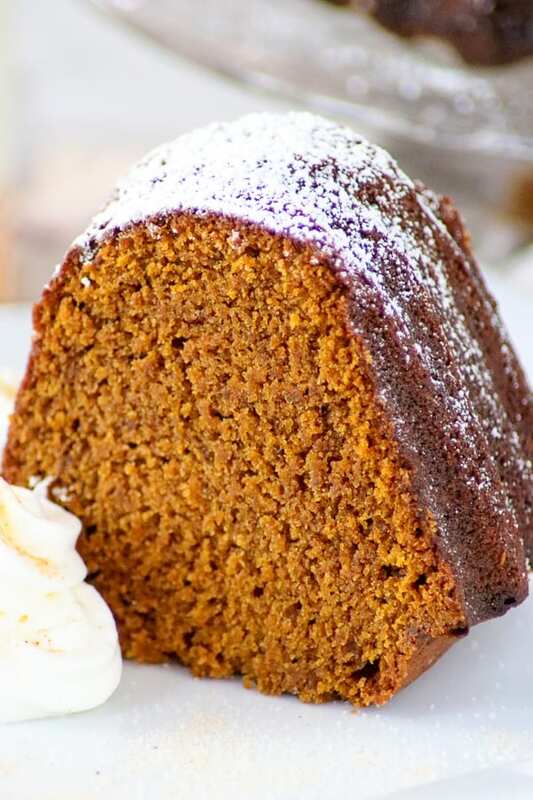 This Chai Spiced Pumpkin Cake? Oh BOY, this CAKE!!! I have to tell you that if I was still rating my recipes on that rolling pin scale when I first started the blog, this would most definitely earn the highest of 4 rolling pins! Yeah, it’s just that darn delicious. And not only is it delicious, it’s one of THE moistest cakes I’ve ever had. No joke. I was wowed by the flavor, too. Using the Oregon Chai Tea Latte Concentrate is most definitely the way to go with this baby! I just might be stingy in the sharing department. Dust with powdered sugar. I use this to sprinkle the powdered sugar over any desserts that call for it. It adds just the right amount without overdoing it. It’s great for cinnamon, too! Seriously. You don’t even need to add any sugar while mixing the cream because the cake is just sweet enough. And please, please, PLEASE do yourself a favor and DON’T use the artificial stuff in the tub. No. 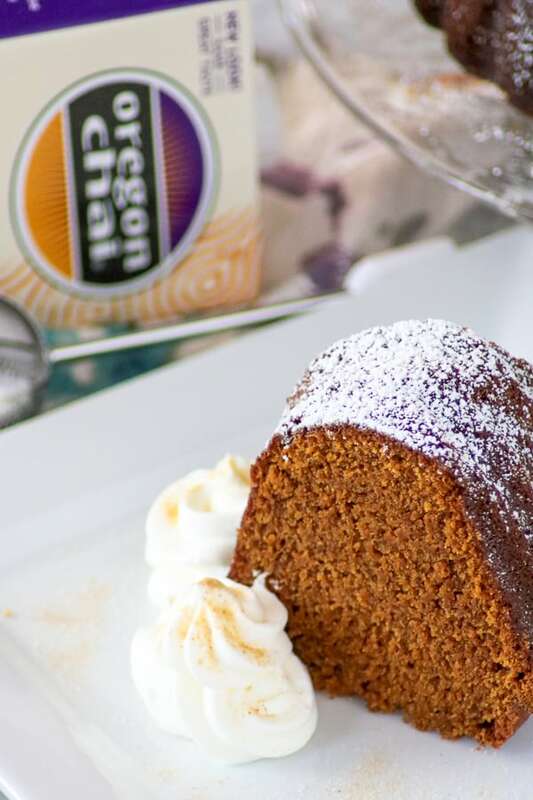 This easy pumpkin cake recipe really only needs the fresh whipped cream. Trust me. 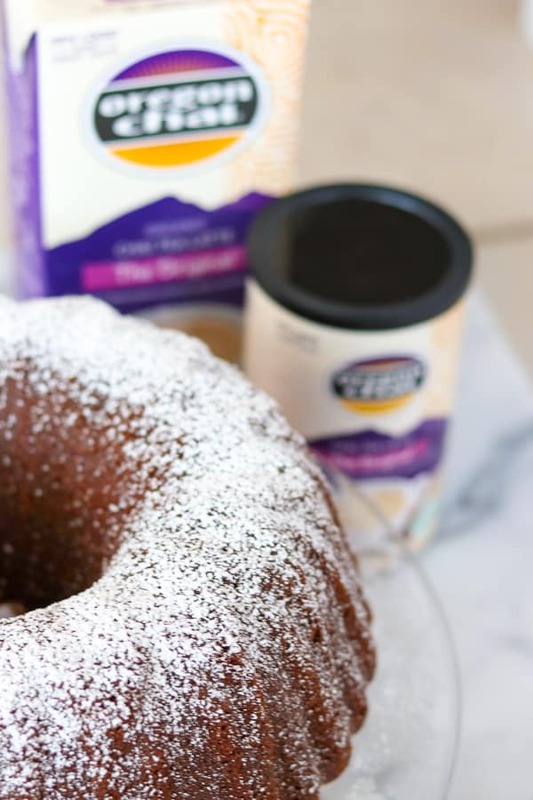 If you desire, you can use this Cream Cheese Frosting if you feel it needs to be frosted. I didn’t add frosting because I felt it would detract from how truly wonderful this cake is. I think you’ll agree. 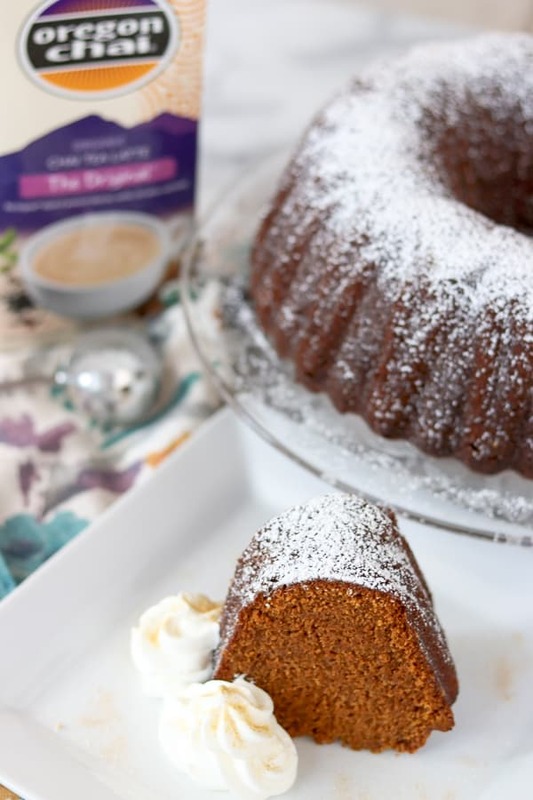 Remember to add Target’s app to your phone, so you can and you too can make this Chai Spiced Pumpkin Cake! Place a rack into the center of the oven and preheat to 350° F.
Use a flour baking spray or generously butter a 12-cup bundt pan, one that is 9 to 10 inches. In a medium bowl, whisk together the flour, baking soda, Oregon Chai Tea Latte Powdered Mix, and salt. In a large mixing bowl, cream the butter until light. Gradually add the sugar and beat until light and fluffy, about 3 minutes. Add the vanilla and one of the eggs. Mix until completely combined and add the remaining egg, doing the same. Add the pumpkin and thoroughly combine. Scrape down the sides and bottom of the bowl and add half of the flour mixture. Mix until just combined. Add remaining flour mixture and mix again. With the mixer on low, slowly add the Oregon Chai Tea Latte Concentrate, mixing well. Pour the batter into the pan, and tap the pan on the counter to remove any air bubbles. Smooth out the batter on the top making sure it is evenly distributed. Bake for 50 - 60 minutes or until a thin knife inserted deeply into the center comes out clean. After the cake has been in the oven for 30 minutes, check to make sure it isn't browning too quickly. If it is, cover loosely with a tent of aluminum foil. Place cake on a wire rack and allow to cool for at least 10 minutes before removing from the pan. 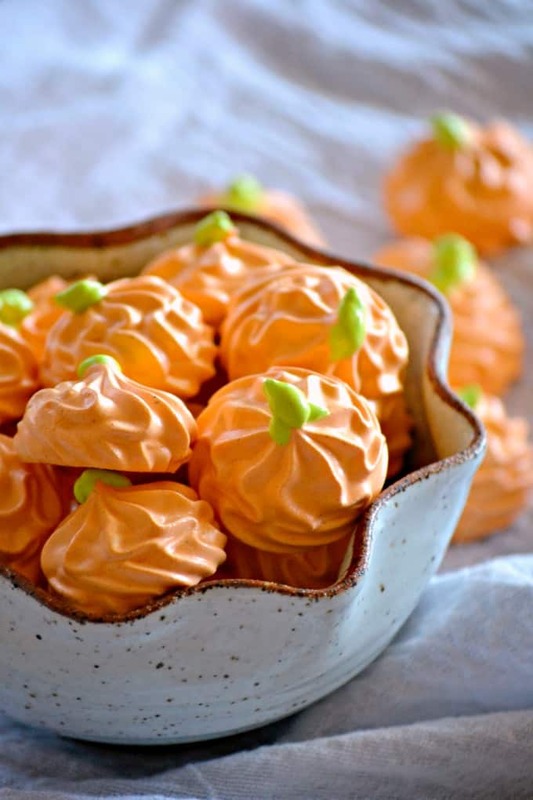 Dust with powdered sugar and serve with fresh whipped cream. These are links that can take you to a product (or products) that I recommend. I do receive a portion of the sales or credit for my future purchases from any items purchased through those links. Your purchases encourage my baking, cooking and butter habit, and contribute to the life of this blog. I thank you so very much for your support. Let’s keep having fun in the kitchen! !